Nothing like cascading ruffles to save a cheap $1 felt Christmas Tree Skirt. This post has been moved to my new blog Inspired by Familia! You can click here to get the full details on how to make your own no sew xmas tree skirt. 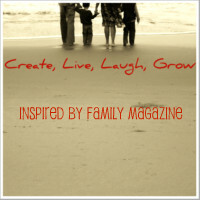 Visit Inspired by Family for other great Christmas Ideas for the home and Fab DIY Gifts & Stocking Stuffers! That's very cute Mari!!! You always impress me!!! Love it! Eeek I've been thinking about all of the new Christmas stuff I need to do this year! Very cute! I feel the same way about buying Christmas tree skirts, etc. I like them and will use them forever but since it's a time to think of others I can't bring myself to shell out the $$ for something like that. I like your solution! It looks beautiful! Great job! That is super cute. I like that you saved time by using a made tree skirt and adding the ruffles. I may actually do this myself now with this short cut, LOL! Visiting from Keeping It Simple. What a great project! I put this on my Winter Pinterest board : ) You can grab an "I've Been Pinned" button at my blog! Thanks ladies for all the love! It makes me want to zip pass Fall decorating and put the xmas tree up! Wow that turned out so cute! Super cute and what a steal for only $1! Very nice. Love the ruffles! Became a follower to keep up on your other great ideas. If you get a chance sometime you'll have to stop by my blog. I am over here via Nifty Thrifty Sunday and am I ever so glad! I love the ruffles!! We use a quilt my grandmother made for me when I was a young girl... think lots of bright polyester! but it brings back many happy memories of my grandma!!! Beautiful! I like the idea of making a smaller one for the kids rooms - we put small trees in each room of the house :) Thanks so much for sharing at Taking A Timeout Thursday! Hope to see you again this week! Please let me know if it's okay to link like this in the future. So darling, love it! Visiting from Homemaker on a Dime! I love this! Visiting from my 1929 charmer! What a great idea, and turned out so cute, from a dollar store. You are one creative person. Thanks for sharing at Sunday's Best. Now following you. What a great idea...that is adorable! I'm your newest follower from the blog hop. I'd love you to stop by my blog & maybe follow along too!